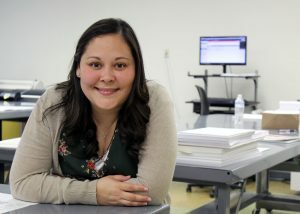 (HARLINGEN) – Monica Garcia is a Business Management Technology student at Texas State Technical College, maintains an impressive 3.9 grade-point average and expects to earn her associate degree in Spring 2019. When the 36-year-old is not busy studying, she can be found volunteering at the Harlingen Neighborhood Food Pantry and Lifeline Heart of Worship church, all in interest of making her hometown of Harlingen a better place. My answer to this whenever someone asks me is, I’m not sure yet, but I will go wherever God leads me and wants me to be. I’ve done the full-time job gig before and I wasn’t happy. I’m at a place in my life now where I want to make a positive impact in lives and make a difference. My dream job is to open a bakery/deli and employ women, who have been victims of domestic violence and have left their homes, to help them get back on their feet, show them their worth and remind them that their talents are needed. My greatest accomplishment is my GPA. Coming back to school after many years and being one of, if not the oldest student in class can be intimidating, but my GPA gives me confidence and shows me that I’m worthy of being in college. The greatest lesson I have learned is that the only thing that can hold me back is fear, and that’s why I work hard at not letting fear enter my thoughts. Through this new journey I have learned that I am strong and courageous and fear has no hold on me. All of my Business Management Technology instructors influence me every day. They encourage me and help me see that I can do anything I set my mind to and are so patient and understanding. My advice for future TSTC students is: do not fear, take a chance, focus on your studies, don’t procrastinate and most importantly, take advantage of the services TSTC offers its students to ensure that you pass and reach your goals.